You are here: Home / Diary / Back to Work as a Therapy Cat! 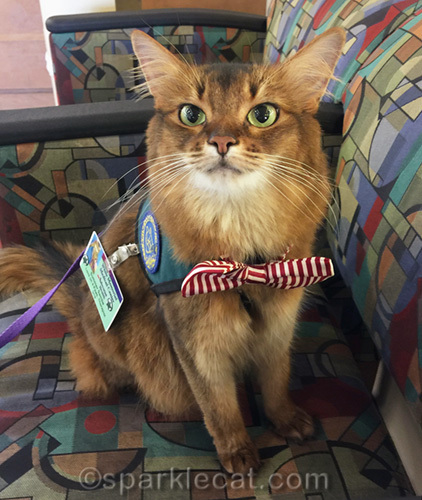 Back to Work as a Therapy Cat! After being away for three weeks because my human was sick, and in between being sick, she took me to Meet the Breeds, I am back to work doing therapy cat visits! And you have no idea how happy that makes me. My human worried that I might be a little “off my game” since it’s been so long. She needn’t have been concernedÂ â€” I was on the beds and purring and doing High Fives right away. The day sure started out weird, though! My human always makes me visit the litter box before we go out, and when we came out of the bathroom, Boodie was in my carrier! It was the one I won, that I thought would be too small for her, too. I’m not sure what she was thinking, but my human had to get her out and me in. Then when we got to the hospital, nobody was going in or out because there was a Code Pink happening. In case you don’t know what that is, it’s a possible infant abduction, so it was pretty serious. But all was clear in a few minutes, and we could sign in. A couple of minutes later, the other team showed up. It was my dog friend, Mr. Scruffles. We actually like each other. It was kind of hard to keep us at the required 6 foot distance. We kept wanting to touch noses, even though my human told me it was not allowed. We saw a lot of children on this visit, which suited me just fine. The first little girl really, really missed her kitty, so she was happy to see me, but she also enjoyed Mr. Scruffles. One boy we saw had just had surgery on his hip. But even though he was pretty knocked out from being sedated, he still smiled and enjoyed our visit and petted me lots. My human took a photo on the Poloroid camera, which is a good thingÂ â€” he might not remember the visit otherwise! Another boy I visited, an older one, really had a nice time petting me. When the nurse asked if he had any pets at home, he said, “No, but I wish I did.” So I was glad to give him a little dose of kitty therapy. It was a really good visit today. Sometimes the patients are nice, but not really all that excited we are there. But nearly all the patients I saw today really were thrilled to see me, and wanted lots of quality time. Then, on the way home, I saw a good luck symbol! I bet you can’t guess what it was, so my human took a photo. 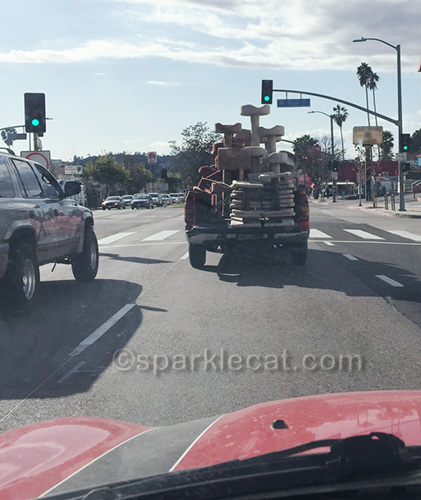 It was the truck in front of us, filled with cat trees. We followed it for maybe a mile or so. You sure did have a great time summer! I hope you were able to keep up with the truck with all the goods! You’re such a pro, Summer, that you’re always on point. Sounds like a fun visit. Oh Summer, I’m sure you brightened up the day for the kids you got to visit at that hospital! Kisses! That sounds like a great visit Summer, and we love mew have a Polaroid camera to take pics, that is genius!!! What a wonderful therapy visit you and your human had, Summer! And those cat trees in the back of that truck … wow! Do you think maybe they chopped them down in a cat tree forest??? yoW, Summer, what a crazy start to your day! sounds like you had some really nice visits. Weâ€™re glad to hear you could get back out there and do your therapy thing, Summer. Of course youâ€™d be on your game…youâ€™re a real pro! We’re glad you had a wonderful day, Summer. And wowee, all those cat trees!! OMC! Look at all those cat trees! I’ll bet you were hoping for a red light so maybe you could hop on one. Your visit sounds like a big success. We’re glad your human was well enough for you two to go on a therapy visit again! It’s wonderful you make so many patients feel better! It would’ve been really wonderful if that cat tree truck pulled up into your driveway too. Just sayin. Glad ya had a good therapy cat visit! Too bad those cat treats weren’t being delivered to your house! I am glad your therapy visit went well. Of course they are pleased to see you. I would be too. boodie wanted to go for a ride… cool. I love seeing those cat trees in a big pickup truck! Reminds us how many cat lovers are out there! You are such a pro, Summer! We’re glad you’re back to doing what you love best. We are jealous of your sunshine, Summer! Boodie wants attention too, Summer…go give her some head butts! Yippee for good therapy visits. You are leaving a wonderful impression on those kids and families. We didn’t know that was a good luck symbol but we can understand how lucky kitties will be to get a new tree! It sounds like you had a really good therapy visit, Summer! We can picture the kids smiling and petting you and having a good time. We know they enjoyed the visit too! Was Boodie going to be a therapy cat too? Too bad those cat trees weren’t heading to your house, that would be awesome. Jumpin’ cat trees that is a lota cat trees. MOL you and Boodie in the same Carrier would have been a heavy load!! I wonder where the baby was that they thought had been abducted? I am sure you made everyone happy that came in contact with you. And that truck of cat trees is something you don’t ever see- wow!!! glad your human is feeling better and you are back to visiting. Code Pink – how scary though. I know they all really enjoyed your visit sweet Summer, you’re a special therapy gal. Of course you didn’t lose a step – you are totally a professional. We’re glad that the visit went so well. And good that your hoomin is much better. Sounds like the young people were happy you came. Too bad a cat tree did not fall off that truck 😉 MOL! Sounds like you had a great time, Summer! Weâ€™ve never seen cat trees in a truck like that!!! Too cool!